Welcome to my blog! 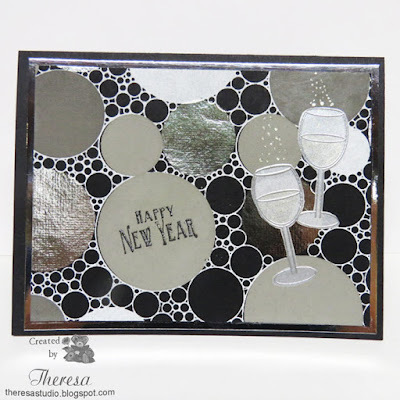 I am celebrating the New Year with a sparkly card that I made with some beautiful shiny paper that was in a Hero Arts kit. I thought it was perfect teamed with some Champagne in glasses stamped with Repeat Impressions Wine Series stamps. I created the glasses with Silver Vellum, Versamark ink, and Silver EP and then fussy cut. Added some bubbles with Stardust pen. Added a layer of Silver Mirror CS and Black card base. I hope you see all the texture and shine in the photo. The New Year stamp is an old one from my stash. The House That Stamps Built: Challenge D2717 Anything Goes. Happy New Year to all at THTSB. Great New Years card....yeah for using an RI stamp!! Thanks for linking your lovely card up to The House That Stamps Built! Beautiful!!! OOo . . . all that sparkle and shine are fabulous! Thanks for playing with The House That Stamps Built.